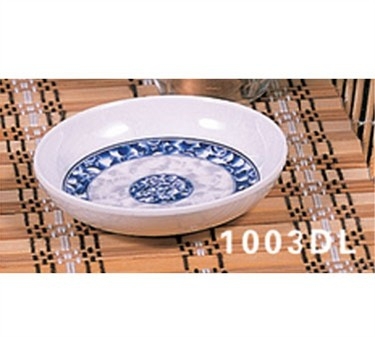 Featuring an intriguing and attractive design, the Thunder Group 1003DL Blue Dragon Sauce Dish 3-7/8" will add to the quality of your dinner or luncheon presentation. This round melamine sauce dish has a 3-ounce capacity that is just right for sauces, condiments, garnishes and small sides. Durable yet lightweight, this sauce dish is a pleasure to handle, washes up safely in a dishwasher and is NSF-approved.